Be the first to share your favorite memory, photo or story of Lisa Lynn. This memorial page is dedicated for family, friends and future generations to celebrate the life of their loved one. 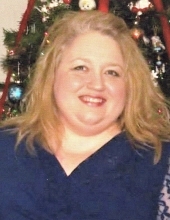 Lisa Lynn Potter Lester, 49 years of age of Harman, VA, passed away Friday, February 15, 2019 at her home, with her family. Born September 15, 1969 in Richlands, VA, she was the daughter of Roger Lee Potter and Barbara Carol Elswick Hunt. Lisa was a 1987 graduate of Grundy Senior High School, a graduate of Wytheville Community College where she received her RN Degree, and was a former employee of Buchanan General Hospital. She enjoyed gardening, cooking and shopping, but most of all, spending time with her family. She was of the Pentecostal faith, a loving daughter, wife, mother and sister. She was preceded in death by her brother Charles Byron Hunt, uncle Danny Elswick, aunt Betty Denise Viers and step father Jerry Hunt. Survivors in addition to her father Roger Lee Potter and wife Carol of Grundy, VA, mother Barbara Carol Elswick Hunt of Grundy, VA, include her loving husband of thirty years, Bradley Dewayne Lester of Harman, VA; daughters Victoria Rose Lester and fiance Russell Thornsbury of Harman, VA, Tayah Elizabeth Lester and boyfriend Joshua Cole of Grundy, VA; sister Stephanie Lea Slone of Grundy, VA; niece Cloe Slone; nephew Carter Slone; uncle Robert Elswick; special niece that was like a daughter Ariana Grace Hunt. Funeral service for Lisa Lynn Potter Lester will be held at the Shortridge-Ramey Funeral Home Chapel of Grundy, VA, Monday, February 18, 2019 at 12:00 noon with Pastor Tim Brown officiating. Burial will follow in the Mountain Valley Memorial Park, Big Rock, VA. The family will receive friends at the Shortridge-Ramey Funeral Home Chapel of Grundy, VA, Sunday, February 17th after 6:00 p.m. with evening service to be held at 7:00 p.m. The family of Lisa Lynn Potter Lester have entrusted the care of their loved one to Shortridge-Ramey Funeral Home of Grundy, VA.
"Email Address" would like to share the life celebration of Lisa Lynn Potter Lester. Click on the "link" to go to share a favorite memory or leave a condolence message for the family.